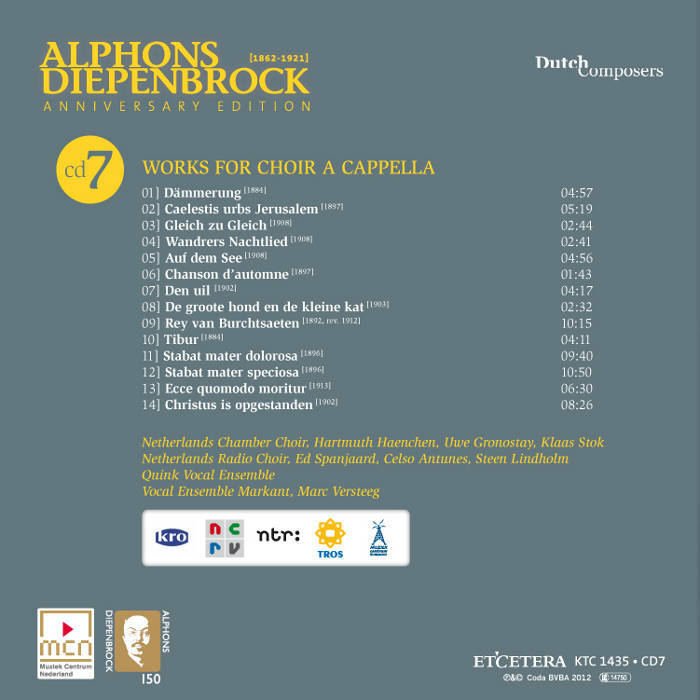 After writing Recueillement (Contemplation) for alto and piano on a text by Baudelaire and then orchestrating the work (RC 79/80) in the summer of 1907, more than a year went by before Diepenbrock started an entirely new work again. During that time he orchestrated several of his earlier songs and put a lot of effort into a drastic revision of his Te Deum (RC 39). In August 1908 the baritone Gerard Zalsman (1871-1949) founded a new ensemble consisting of the soprano Johanna van de Linde, the alto Hermine Scholten (1881-1945) and the tenor Jacques van Kempen (1875-1939). This inspired Diepenbrock, who had attended a rehearsal of these excellent singers, to write three vocal quartets. In his search for suitable texts, he leafed through Goethe’s poems and came across Gleich zu Gleich (Like to Like) and as I had not composed anything for a year, I made this first as a work of craftsmanship, for fun . (BD VI:13) Later comments by Diepenbrock confirm this: I made it as a study and as a virtuoso piece for Zalsman’s quartet on a rainy Sunday afternoon. (BD VII:77) Diepenbrock wanted his composition to be a parody, one on the German Lieder style of Beethoven’s time . 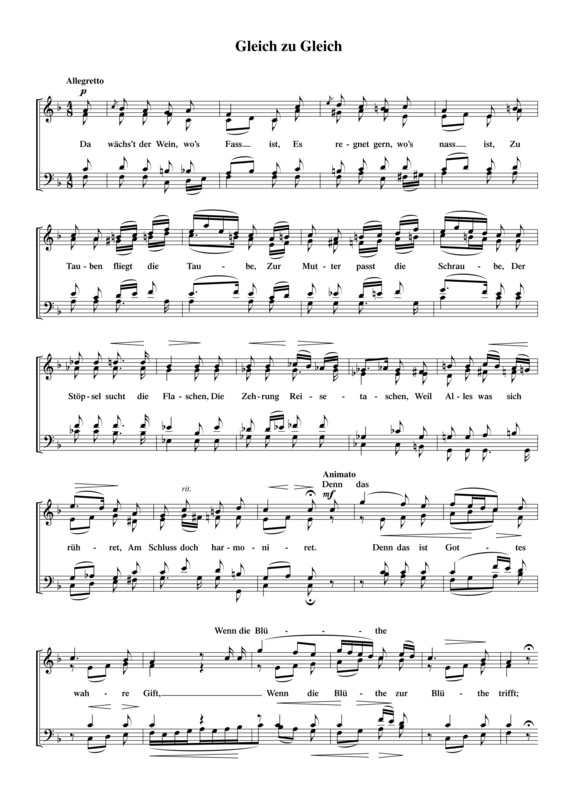 (BD VI:14) Especially the final passage of Gleich zu Gleich requires vocal virtuosity, where on the word “harmoniret” (harmonises) all four voices sing a coloratura-like melisma and – in succession – execute a trill lasting two measures. The Zalsman Quartet premiered the piece in the Diligentia Theatre in The Hague on 20 October 1908, alongside Diepenbrock’s Wandrers Nachtlied (Wanderer’s Night Song, RC 86), which was performed for the first time in the version for vocal quartet, and Den uil (The Owl, RC 56). The programme also included works by several ‘old’ masters: Clemens non Papa, Adriaen Valerius, Leonard Lechner, Baldassare Donato, Claudin de Sermisy, Orlando di Lasso, Clément Janequin, Mathieu Gascongne, Guillaume Costeley and Michael Praetorius. In addition to Mozart, the Romantic period was represented by Carl Loewe and Brahms. Finds its balance in the end. Are so ready for love in the spring. 20 okt 1908: Eerste uitvoering van Wandrers Nachtlied en Gleich zu Gleich in Diligentia te 's-Gravenhage door het Zalsman-Kwartet (Johanna van de Linde, Her­mine Scholten, Jac. van Kempen en Gerard Zalsman). Voorts wordt van Diepenbrock nog gezongen Den uil, overigens composities van Clemens non Papa, Valerius, Lechner, Donato, de Sermizy, Lasso, Jannequin, Gascogne, Costeley, Löwe, Mozart, Praetorius en Brahms, in totaal 21 nummers. Veel succes had het kwartet met Diepenbrock's komisch liedeken Den uil, dat er wel heel onschuldig uitziet maar lang niet gemakkelijk te zingen is.